The Wachowskis for 'Justice League'? They've Already Done It! The Wachowskis for ‘Justice League’? They’ve Already Done It! 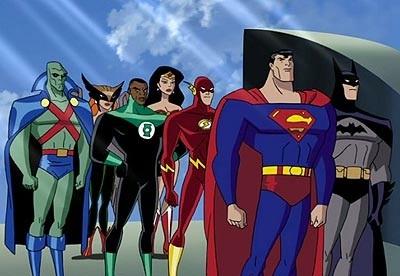 It might not be fair to keep teasing the public with possible big name directors for the developing Justice League movie, but the ambition and excitement behind as people swirling around every name in contention. As the world struggles to get over the disappointment in Ben Affleck revealing to 24 Hours that the project is “not something [he’s] working on,” we go on the rebound with a new potential team for the film: Andy and Lana Wachowski, the masterminds behind The Matrix series. Moviehole reports that the Wachowskis are on Warner Bros’ short list to take on Justice League. Hollywood.com reached out to Warner Bros. and The Wachowskis for comment. It is likely that a mysterious calm has overtaken you in light of this news. “Why does this seem so… appropriate?” you might ask. Why are you so sure that the Wachowskis can handle a feature film encompassing the DC Comics superheroes? Simply, because they’ve done it all before. You’ve seen the Wachowskis tackle the likes of Superman, Batman, the Flash… sort of. Think of The Matrix. Star Neo is the chosen hero of humanity, called upon to accept his fate, leaving his old life behind to defend the world against the evil agencies working against the constructs of “good.” Neo is impenetrable, he is incredibly strong, and he can fly. Neo is Superman. The Wachowskis might not have directed V for Vendetta, but they did adapt the script from David Lloyd’s graphic novel. The film stars Hugo Weaving as the unnamed hero — a masked and caped vigilante, whose insatiable craving for vengeance against the purveyors of terror was born out of a nebulous trauma; a trauma that left him alone in the world and disconnected from the very idea of love, abandoning his own sense of self to become the idea of a hero for his corrupt city. In other words: Batman. And finally: the 2008 Wachowski film, Speed Racer. It’s about a guy who is super fast. You know, like the Flash. That guy’s super fast. Vroom! Unavoidable connections. Combine this with whatever Aquaman themes are inherent in Cloud Atlas (you know there have got to be a few), and it’s clear to see that the Wachowskis have been practicing for a Justice League movie for years now. Take the red pill, Wachowskis. Delve into the vast world of DC Comics. ‘Justice League’ Could Land Ben Affleck… to Direct!